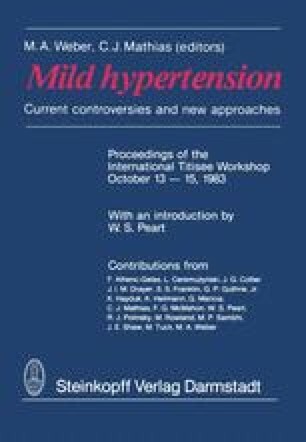 The fairly conclusive demonstration by the Veterans Administration Cooperative Study Group on Antihypertensive Agents (1967) of the strikingly favourable effect of drug treatment on morbidity associated with untreated moderate-to-severe hypertension generated global interest. It suggested that physicians should be made more aware of effective regimens for antihypertensive therapy. A subsequent analysis of the results of the VA trial (Walker et al. 1982) indicated that the benefits of drug treatment, in terms of reducing mortality and morbidity, were, in gross terms, proportional to the therapeutic reduction of blood pressure.